Parents or guardians of mentally ill people in Kosovo face a tough decision – place their children in sub-standard institutional care, or leave them to roam around alone, and possibly come to harm. They see him all the time, day and night, rain or shine, summer or winter. In the village of Talinoc i Jerlive, a few kilometers from Ferizaj, everyone knows Jusuf Hasani, known as ‘Cufa’. Everybody also knows that he suffers from mental health problems. From the village where he lives with his mother, he walks to the town on foot every day of the year, leaving his house in the morning and returning the same evening. His presence in Ferizaj is well known, as he trudges through the same streets and alleyways. His mother, 61-year-old Mevlide, never stops worrying until he returns home. “I worry a lot because he is my only child, and I cannot trust anyone. He is very nervous if someone teases him. He hates it when someone overdoes the teasing,” she said. Jusuf is the only one of Mevlide’s eight children to survive infancy. The others, all born before Jusuf, did not live long. She was overjoyed when he was born, but her world was turned upside down when she realized that his mental and cognitive development was limited. Jusuf loves to hang out in the town, she said, because besides her, there is no one else at home. But the streets of the town have not been kind to him. On occasions, people have mocked and even beaten him. “Once he earned some money from selling some metal. He then told me: ‘I’m going to buy a pair of trainers.’ But on his way, two boys tied him up and took his money,” she recalled. There are others like Jusuf in other towns and cities in Kosovo, also with mental health problems, wandering the streets, sometimes coming across friendly people, but sometimes not. Neuropsychiatrist Fahri Drevinja says most people like this who roam the streets refuse to comply with doctors’ advice, do not take their medicine and, in consequence, manifest anti-social behaviour. “Besides others, they jeopardize themselves. They do not know how to protect themselves in traffic and from other risks that arise on the street,” he said. Kosovo’s state institutions do not collect accurate data on the number of people suffering from mental health problems. But worldwide trends suggest such problems are worsening in many countries. “In most other countries, the number of people with mental health problems is increasing. An increase has been noted also in depression, exhaustion or ‘burnout,’ as they call it in the West,” Drevinja noted. The University Clinical Center of Kosovo. | Photo: BIRN. 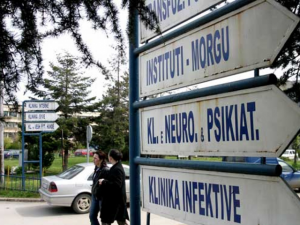 Those diagnosed with mental health issues are entitled to 75 euros a month as state support in Kosovo. Drevinja says this is not enough to cover even the cost of basic medicine. The Ministry of Health in Kosovo is responsible for those who are hospitalized with mental health disorders, but it is different for others who hang out on the streets. The police treat people with mental health problems who pose a risk to citizens in accordance with the criminal code, but in cooperation with health and social institutions. A court order can see them removed to institutional care. Otherwise, they go back to the streets. One problem in Kosovo is that responsibility for the mentally ill is divided between different institutions. Mental ‘disorders’ fall under the responsibility of the Ministry of Health. But people with mental ‘disabilities’ fall under the care institutions within the Ministry of Labour and Social Welfare. And for those with mental problems who roam the streets, no institution appears to take direct responsibility. The burden falls on family members or legal guardians. Albatrit Matoshi, from the health ministry, says the ministry assumes responsibility only when people are removed to institutional care. “The ministry is not competent to deal with people on the streets with mental illnesses. Police and the courts, or relatives, must first take action to settle them in health institutions,” he explained. In the first nine months of 2018, he added, mental health services carried out 5,308 household visits. But Drevinja said that not all those with mental problems who hang out on the streets need to be put in hospitals or institutions. This should only be done if they pose a constant threat to themselves and to others, or are not protected by their families. However, the standard of care in Kosovo mental health institutions is often far from high. The Kosovo Ombudsman’s office has received numerous complaints about these institutions. As a result, it conducted an investigation and came up with reports and recommendations. It has published four reports in all, criticizing the treatment of people with mental disorders generally. In one report, the Ombudsman concluded that the need to remove people who pose a threat to others in public was urgent. “Those who are willing to cause physical violence and damage property should be removed from the public space and be treated in mental health institutions until it is sure they will not cause harm to the neighborhood and to society,” the report reads. Beyond such institutional complexities, Jusuf’s mother needs to find a long-term solution to her only son’s dilemmas. Her greatest anxiety is what will happen to him when she is no longer alive. “When I die, I’m afraid to leave Cufa behind – because besides God and me, he has no no one else,” she concluded. Feature photo: Jusuf Hasani in the streets of Ferizaj. | Photo: Donika Gashi. This publication has been produced with the assistance of the European Union. The contents of this publication are the sole responsibility of Donika Gashi and can in no way be taken to reflect the views of the European Union or BIRN and AJK.